Perelandra Soil Balancing Process Kit - Perelandra Ltd. Instructions for using these soil balancers are included with the process steps explained in The Perelandra Garden Workbook and in the Perelandra Microbial Balancing Program Manual. Buying the Kit by itself isn't going to make much sense to you. The kit contains 1-oz. vials of the following: bone meal, cottonseed meal, dolomite lime, greensand, kelp, corn gluten meal and rock phosphate along with a 1/2-oz. bottle of ETS Plus for Soil. The kit has enough for about 45 tests from each vial. When doing the "Troubleshooting 2.1" processes explained in The Perelandra Garden Workbook, you'll need to have additional soil balancing options. 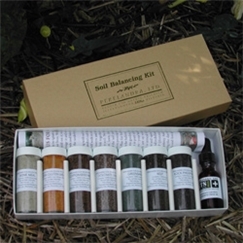 Add the Co-Creative Gardener's Kit to your basic Perelandra Soil Balancing Kit. Or at minimum, add Essence of Perelandra (EoP) to your basic Soil Balancing Kit options. some countries have strict customs regulations that do not allow items like bone meal, dolomite lime, greensand, kelp, corn gluten meal and rock phosphate to be shipped into their country. If you live in one of these countries, you will need to work with nature to determine what soil balancing options to use and put together your own, personalized soil balancing 2.1 kit. For this, follow the instructions on pages 256 - 257 of the Garden Workbook. This process is not a substitute for soil fertilizing.